There are questions which, depending on someone's current state of consciousness cannot be answered with the rational mind. Trying to rationalise some of the actions of our parents is one of them. From our own personal experience and perspective only, this can prove impossible. As we are missing knowledge and important facts about their lives, the image we create of them can only be a partial one. Details of their childhood are missing, or how they were educated or the experiences they went through. The fact that they don't share such experiences with their children does not help us to understand the whole spectrum of who they are. It is not always easy to share our experiences and traumas with others, and for a parent; this is not different. In addition, some parents do not share traumatic experiences that shaped them into who they are, as they have assimilated them and perceived them as normal. By assimilating negative experiences anyone can be led to believe that if they survived the experience, others, including their children can survive and be strengthened by them. To change this cycle, we must take responsibility, transcend the experience and break with such patterns so as to make sure that the energies of these erroneous beliefs end with us. A common example would be, if our parents abused us physically, we don't use the same methods with our children as a corrective. There is always a better way. As long as we look at the situation from our unique personal angle, one will never find the peace that only acceptance can provide. Let's begin with the fact that the actions of some parents might seem unforgivable from any perspective. Such actions do no go unnoticed to the Universe. No one gets away with anything forever, even when this seems to be the case. While it might seem that these actions remain hidden to the public eye, and that someone is the only person suffering their consequences, the truth is that many people determine what they will receive from life in later years. This text is to encourage understanding and letting go. 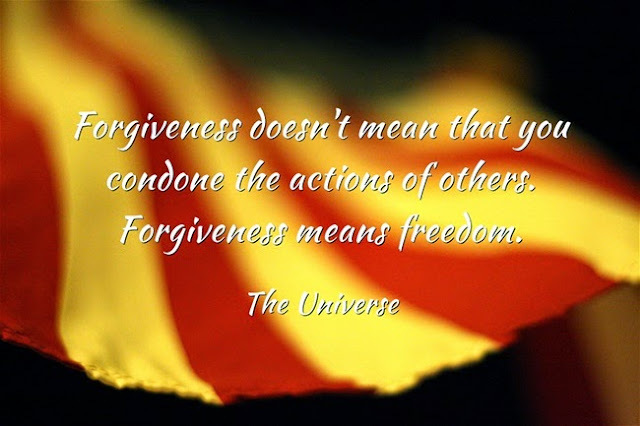 Forgiveness is optional and a very personal decision. One must always follow their heart. Some actions are inexcusable and one might not feel that they do not deserve forgiveness. Yet, any action can be forgiven when we open our hearts to love. In situations of abuse, it is not only what a parent can do to their children, but what one human being can do to another. There is no need to expand on this, as examples of humanity's cruelty and brutal treatment of others are well known and far too common. Even those who hide their heads under the sand, so as not to see, can see them. A reminder: the heart never follows the path of hate, only the ego does. In order to heal it is essential to transcend our experience, regardless of what it might have been. The answer to all our questions is in love. Everyone does their best from their level of consciousness. Abusive parents aside, what the majority want for their children is to offer them the best they can, better opportunities than they had.To begin to understand our parents, we must realise that however difficult our experience has been, in most cases, they had it tougher. Parenting does not come with an instruction manual and mistakes are made no matter how well-meaning or conscious a parent is. Whether someone has been the victim of abuse or not, everyone carries a trauma, even those with what appears to be very nurturing and comfortable childhoods. A parent, like the majority of us, is someone whom at some point in their lives, and due to personal traumatic experiences, unknowingly lost touch with their soul, their heart and their natural ability to love, to become a product of their circumstances. If you believe that you are the only child interrupted, take a look around; everyone's childhood's was interrupted in one way or another. Their dreams are most likely buried deep within, unexplored and possibly, in a not so feeling heart. Sooner or later unfulfilled dreams return to everyone with a vengeance and full of regret. Depending on what we have done with our lives, that day in which one rejoices or regrets what they didn't do comes to everyone. It is everyone's responsibility to make their lives a better place. Blaming others for what is going on in our lives is an easy way out, and an excuse not to grow which never helped anyone to develop. How long someone holds on to the past, so as to avoid the responsibility to live the present fully, it is a very personal decision. If we could go back in time and witness what the childhood of our parents was like, we would see that most of the patterns and behaviour they have towards their children was also inflicted on them. When exposed for a prolonged period of time, such as childhood, to a set of values and behaviour, many individuals understand that this is normal and the right thing to do. According to their education and society's standards, they might introduce changes; thus evolving and breaking somehow with the past. But not always. Some parents continue being as strict with their children, as their parents were with them. Somewhere along their path, they forgot that some methods used to discipline and educate them didn't bring the expected results.The energy of such methods are already deeply ingrained in them, and their reactions are as automatic, as they are unconscious. It comes without thinking. This means, that even though they don't mean it, they will in many cases, behave as their parents did. These patterns will continue until they reach a new level of awareness and consciousness. One of the unspoken roles of children is to educate their parents from a most conscious state, and to remind them of a higher consciousness they might have forgotten. Let's not underestimate the power of the energy to which we became accustomed to live with. If as a child, we were constantly told to behave in public situations while visiting others, forcing a child not to move, and sometimes to not even to talk; this child is going to grow up to be an adult that might find difficult to express themselves with ease in public. Our field of action was restricted, and due to the fear of suffering the consequences of breaking the rules, little by little, a child begins to live within these imaginary walls, thus creating a prison. This child is very likely to become a parent one day, believing that we all belong in the same self-contained prison. Throughout history, children have been considered more of a nuisance, than complete and fully formed human beings. Society has learned to control children and to put a lid on anyone's dreams and aspirations. This applies to everyone, including your parents. Every form of control is also a form of fear. Every action taken to suppress creativity in an individual equals to an injection of fear. In this case, it is an injection of negative energy contributing to separate from the soul. Every experience we go through comes with an energy that accumulates in our bodies and remains within, controlling and determining our future actions and adult life. Getting rid of this energy in a world that bows to fear is not an easy task, as it can be a slow and painful process. No one wants to admit to their own truth. No one wants to deal with fear. The result is a world that bows to fear refusing to confront our reality. There is no change without reality. Living with this energy within can make life a living hell for any individual. A part of us wants to love and be loved, do the right thing and create a better world for ourselves and everyone else, as we still remember where we come from and what we are here for. The feeling and idea of freedom is very strong in any human being, and it is also the one that will eventually allow us to live in a free world. It is a personal choice to follow it or to keep living in fear. The only way to face fear, so as to overcome it, is to allow ourselves being completely vulnerable and feel it for as long as it takes. Instead, we follow the dictate of fear, even when we believe that we are being defiant. Everyone has been touched by fear. Everyone lives with this energy within until the moment we choose to leave it behind and surrender to love. Understanding this energy is very important in the healing process. Unconscious actions are those that even though might come from our best intentions towards personal freedom, become acts of rebellion still dictated by fear and at the service of fear. At a certain age, we begin drinking, smoking, taking drugs, mindless sexual experiences, violence and a long list of actions that do not help anyone. All these substances and actions only serve to keep feeding fear, even if our egos validating them by telling us that we are breaking with conformity and the unconscious rules of society. In this way, and under such energy, we become parents. It doesn't mean that we become bad parents, only that we make decisions from the perspective and understanding of what we know. What we know better is fear. There is love, of course. It is not as if every action is driven by fear. But these loving actions are coerced by a subtle fear. It is never too soon nor too late to forgive our parents, and in the process to forgive ourselves. I had reasons not to talk to my parents for the rest of my life. The past tense in the previous sentence is very deliberate. I had. I no longer have any excuses or reasons today. My past has not changed. I have. Instead, I see a wonderful family. Loving and supporting parents who did their best, and to whom I am very grateful. Two marvelous siblings. An incredibly beautiful daughter in every sense of the word. A fantastic and inspiring life filled with magic and all sorts of experiences. I have amazing friends. Love within and love all around. I have witnessed miracle after miracle throughout. Only in gratitude and forgiveness I learned to see this and be able to live In Love and in Freedom. Today, I wouldn't change anything from my experience, not even from my childhood. Believe it or not, we choose our parents before we are born, and so the experiences that shape us into what and who we are. The secret to see the beauty and magic in our lives is not so secret and a very simple one: return to childhood and remember what made you smile. When I took responsibility for my life and chose to become a better person and to continue doing so every day I realised that the possibility to follow my dreams and my passion were there all along, that it was a choice I choose not to take. Today I know that writing to inspire and encourage others is a daily choice. And that this realisation is freedom. My past remains the same and it's different at once, as now I look at it from a different perspective and with different eyes. Perhaps the best part is that I no longer have to look at my past. It's not who I am. Every day is an opportunity to follow your dreams, to improve yourself and to make this world a better place. The choice is yours. No one else can make it for you.